This secretive Quaker chapel is set back behind a garden in Bury's trendy St John's Street. 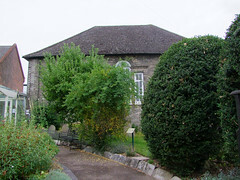 The garden is open every day, a pleasant spot to sit for a while in the busy heart of the town, and as you step up to the path the chapel reveals itself from behind the trees and shrubs. What is not immediately apparent is that this is a timber-framed building of 1749, a date at which Bury was rapidly expanding itself in stone and brick. The white brick here frontage was not added until 1870. There is a good modern extension of 2008 to the south. In contrast to just about every other Christian denomination, the Society of Friends was in steep decline in Suffolk by the middle years of the 19th Century. 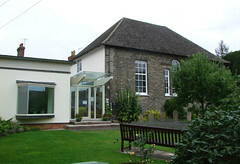 At the time of the 1851 Census of Religious Worship, when the sizes of many congregations were reaching their peak, Quaker chapels were falling in numbers and even closing - of the thirteen Quaker chapels in Suffolk at the start of the century, only eight still held regular meetings by the time of the census. At Bury St Edmunds, the 350 spaces in the chapel (150 on the floor, 200 in the gallery) played hosts to just 26 people in the morning and 24 in the afternoon on census day, the afternoon attenders presumably being largely people who'd been there in the morning. And yet, the Quakers still had influence, not least because of the disproportionate number of prosperous merchants among their members, including two of the county's leading banking families. 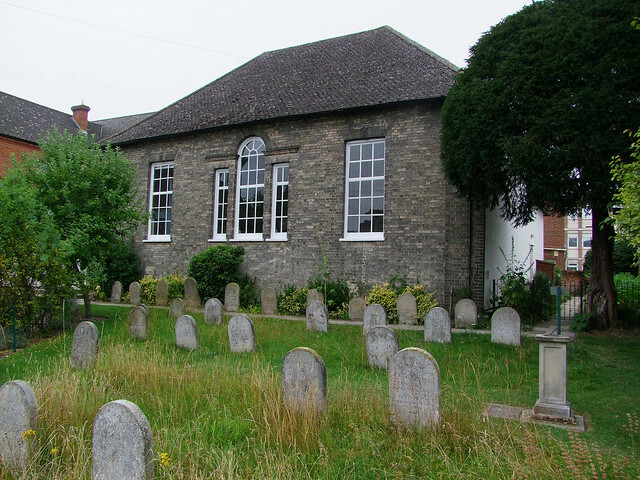 Ironically, this may have been partly responsible for their decline, as the ordinary working people who flooded the other non-conformist chapels saw the Quakers, like the Church of England in many places in the county, as the church of their Masters. The fact that children were discouraged from attending services can also not have helped. And yet, the Quakers have survived, and are respected and valued as a contemplative movement in a frenetic world. 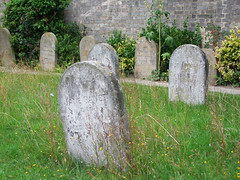 Along with the Jews, the Quakers were specifically excluded from the requirements of the burial acts of the 1850s, and were able to continue burying their dead in urban chapel yards. There is a lovely little graveyard here in front of the chapel, with headstones of the late 19th and 20th Centuries. In the Quaker tradition, they are merely inscribed with a name and the date of death in numerical fashion.